Out of thousands of stocks that are currently traded on the market, it is difficult to determine those that can really generate strong returns. Hedge funds and institutional investors spend millions of dollars on analysts with MBAs and PhDs, who are industry experts and well connected to other industry and media insiders on top of that. Individual investors can piggyback the hedge funds employing these talents and can benefit from their vast resources and knowledge in that way. We analyze quarterly 13F filings of over 700 hedge funds and, by looking at the smart money sentiment that surrounds a stock, we can determine whether it has the potential to beat the market over the long-term. Therefore, let’s take a closer look at what smart money thinks about XPO Logistics Inc (NYSE:XPO). XPO Logistics Inc (NYSE:XPO) was in 44 hedge funds’ portfolios at the end of the third quarter of 2018. XPO shareholders have witnessed a decrease in hedge fund sentiment lately. There were 47 hedge funds in our database with XPO positions at the end of the previous quarter. Our calculations also showed that XPO isn’t among the 30 most popular stocks among hedge funds. “XPO provides comprehensive supply chain solutions, primarily transportation and logistics, to various industries benefiting from the e-commerce revolution. XPO’s best-in-class software technology and cloud-based data solutions are critically important to global customers and reflect platform-like dynamics as online and omnichannel retailers absorb increasing portions of consumer spending. The company enjoys rapidly expanding network effects from its contract logistics and last mile delivery as new shippers and customers enter the e-commerce marketplace. With only 1.5% market share of the fragmented $1 trillion global transportation industry, XPO has copious opportunities to compound intrinsic value both organically and via acquisitions. The capital allocation skills of Outsider Brad Jacobs, Chairman, and CEO are critical to our investment thesis. Prior to XPO, Mr. Jacobs successfully led two public companies: United Rentals, which he co-founded in 1997 and United Waste Systems, Inc., which he founded in 1989. He spent two years performing industry research, talking to experts and understanding the importance of technology and data in logistics and transportation before deciding to launch XPO. Known for his maniacal focus on details and long-term business strategy, Jacobs invested $100m of his own capital to start the company and currently owns 17% of the stock. His unparalleled work ethic is often compared to two other Outsider CEO’s, Jeff Bezos and John Malone. 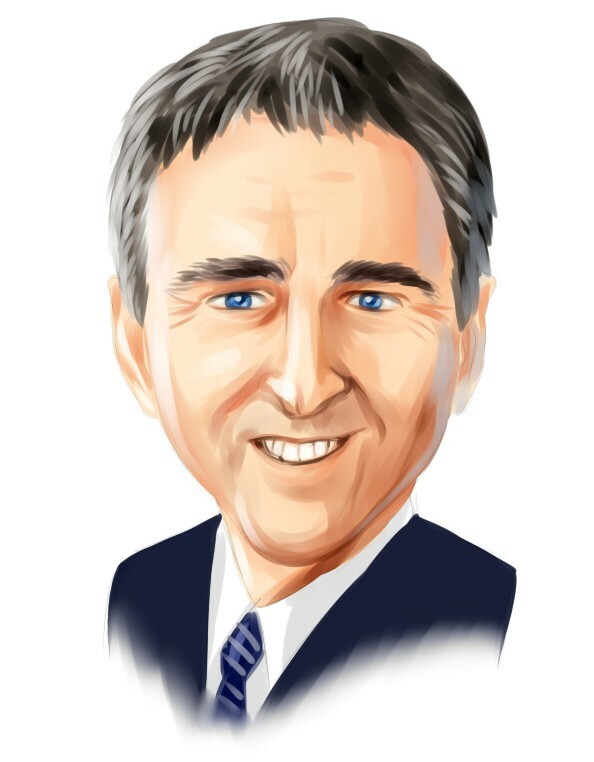 Let’s review the new hedge fund action encompassing XPO Logistics Inc (NYSE:XPO). What have hedge funds been doing with XPO Logistics Inc (NYSE:XPO)? At the end of the third quarter, a total of 44 of the hedge funds tracked by Insider Monkey were bullish on this stock, a change of -6% from the second quarter of 2018. 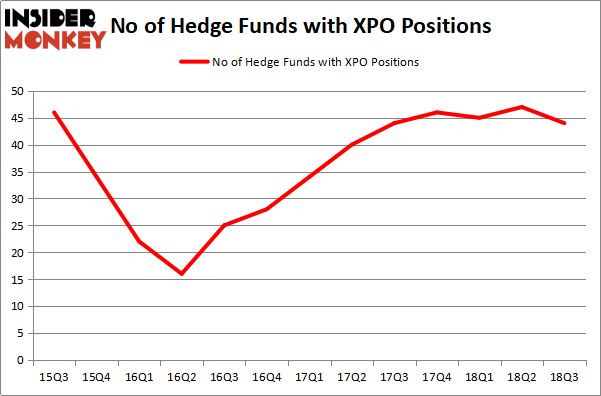 The graph below displays the number of hedge funds with a bullish position in XPO over the last 13 quarters. With the smart money’s sentiment swirling, there exists an “upper tier” of key hedge fund managers who were boosting their stakes substantially (or already accumulated large positions). When looking at the institutional investors followed by Insider Monkey, Orbis Investment Management, managed by William B. Gray, holds the biggest position in XPO Logistics Inc (NYSE:XPO). Orbis Investment Management has a $2.017 billion position in the stock, comprising 11.6% of its 13F portfolio. The second most bullish fund manager is Doug Silverman and Alexander Klabin of Senator Investment Group, with a $188.4 million position; the fund has 2.4% of its 13F portfolio invested in the stock. Some other professional money managers that are bullish contain Ken Griffin’s Citadel Investment Group, David Tepper’s Appaloosa Management LP and D. E. Shaw’s D E Shaw. Since XPO Logistics Inc (NYSE:XPO) has faced a decline in interest from hedge fund managers, logic holds that there lies a certain “tier” of money managers that slashed their positions entirely last quarter. At the top of the heap, Kevin Michael Ulrich and Anthony Davis’s Anchorage Advisors dumped the biggest investment of the “upper crust” of funds followed by Insider Monkey, totaling close to $60.1 million in call options, and Alexander Mitchell’s Scopus Asset Management was right behind this move, as the fund dropped about $25 million worth. These bearish behaviors are intriguing to say the least, as total hedge fund interest dropped by 3 funds last quarter. Let’s now take a look at hedge fund activity in other stocks – not necessarily in the same industry as XPO Logistics Inc (NYSE:XPO) but similarly valued. These stocks are The Liberty SiriusXM Group (NASDAQ:LSXMA), Gartner Inc (NYSE:IT), Godaddy Inc (NYSE:GDDY), and The Liberty SiriusXM Group (NASDAQ:LSXMK). This group of stocks’ market values match XPO’s market value. As you can see these stocks had an average of 37 hedge funds with bullish positions and the average amount invested in these stocks was $2342 million. That figure was $3385 million in XPO’s case. Godaddy Inc (NYSE:GDDY) is the most popular stock in this table. On the other hand 0 is the least popular one with only 13 bullish hedge fund positions. XPO Logistics Inc (NYSE:XPO) is not the most popular stock in this group but hedge fund interest is still above average. This is a slightly positive signal but we’d rather spend our time researching stocks that hedge funds are piling on. In this regard GDDY might be a better candidate to consider a long position.